April 1, 2016 — I wonder if in the history of horror stories there has ever been a…plot…where a gravestone haunts a person. Not what’s under the gravestone, but the gravestone itself. And I wonder this because, for years, I have been haunted by a gravestone. I’ve seen it everywhere people write about the macabre, about taphophilia, about death. The image illustrates so many articles, adorns so many Pinterest boards, pops up in so many presentations in the world I shove my head into regularly. 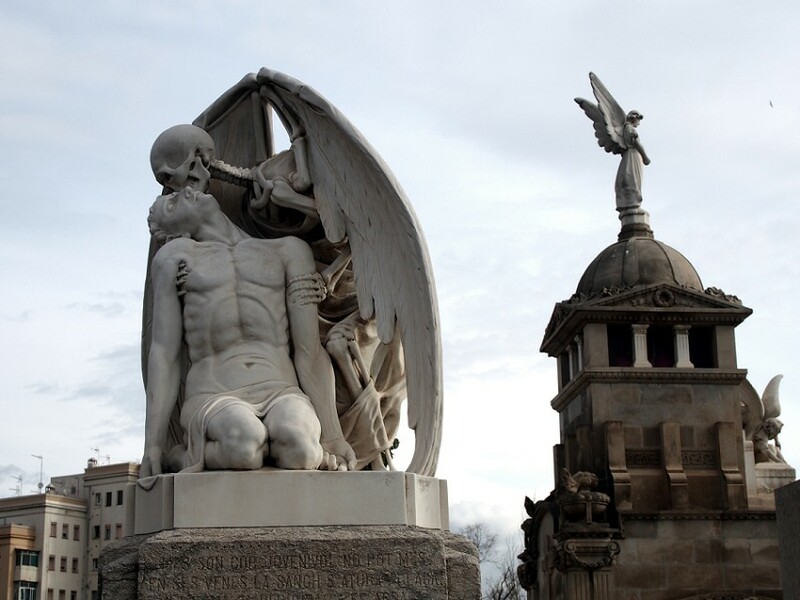 That gravestone is a marble statue of a skeleton with wings kissing a limp, near-naked man. I had so many questions about this thing. 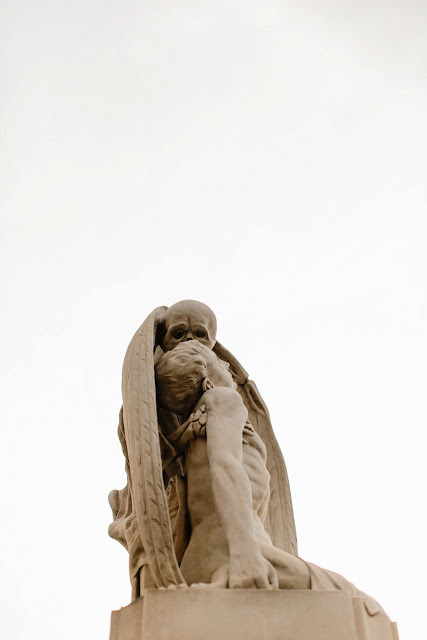 Does it actually mark a final resting place or is it just a funerary statue? How old is it? Is it life-sized? Okay, I had three. But I really only knew one thing about it. That it’s in Barcelona, Spain. So, eventually, I went to Barcelona, Spain. Or returned to Barcelona, Spain, I should say. I went four years ago, but couldn’t find my way to looking up this statue. Since then, the hauntings have become more acute. 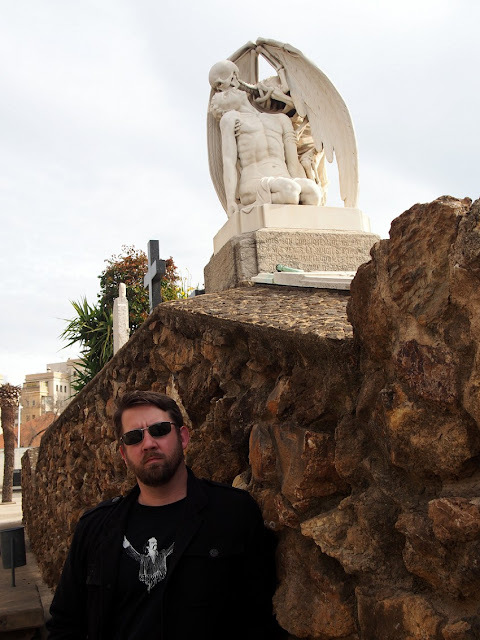 So, earlier this year, when I once again found myself in the capitol of Catalonia, I wasn’t going to leave until I had made the acquaintance of this gravestone, I don’t care who I had to be a jerk to. Sometimes you get one chance, sometimes a second. You never get a third. Except when you do, and then you just say you never get a fourth. 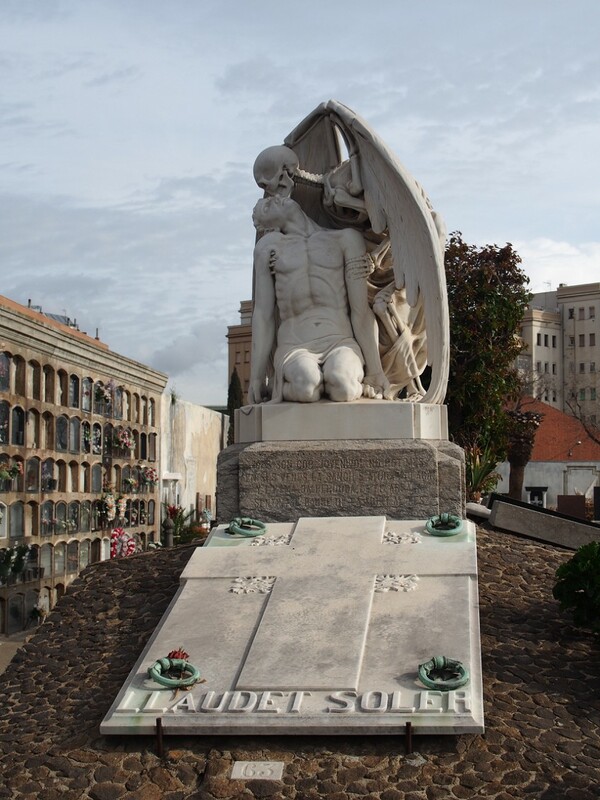 The statue is in Poblenou Cemetery at the end of Av. Icària, just across a highway from the Mediterranean. Its gates are auspicious, a pillared opening topped by an angel with a trump casually angled across his knee as if he’s idly wondering whether he should blow that brass and wake the dead or get some lunch instead. This cemetery sits on the bones of a previous cemetery dating back to 1775. That one got pulverized by Napoleon's forces in 1813. Today’s version was built six years later. Inside, past a slick, freestanding touchwall and a sign prohibiting photography that I was destined to ignore, was a small labyrinth of the dead. 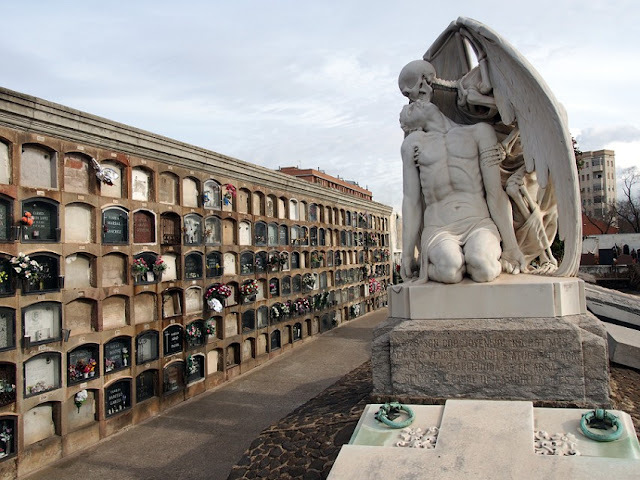 The cemetery is mostly made up of rows of 15-foot-tall walls filled with crypts. In the U.S., these are often the least interesting cemetery architectures. However, here, most of the crypts were fronted by a glass door, and in the two inches between the face of the crypt and the glass of the door were displayed personal and religious mementos for the deceased. Every dead person had his or her own shadowbox. 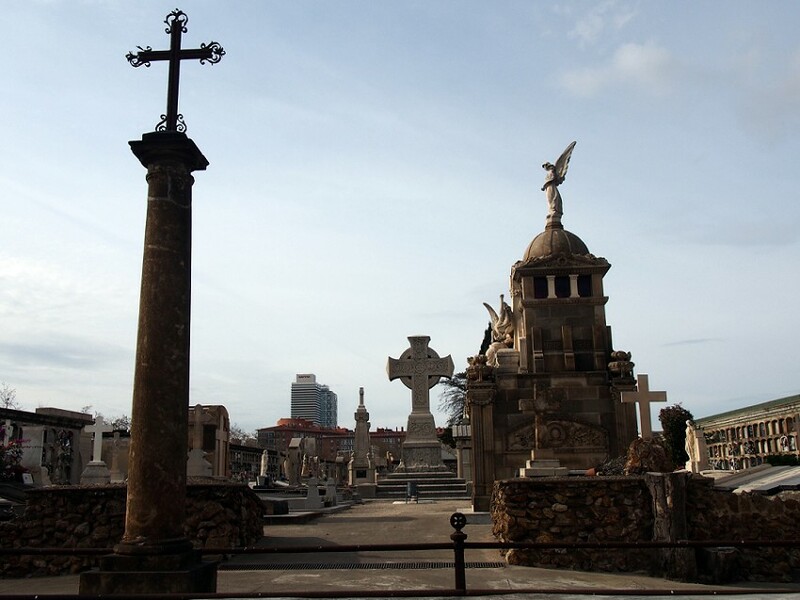 Rolling metal ladders were placed throughout the cemetery for people to use to reach the top-most crypts. I saw a woman atop one replacing mementoes and Windexing glass. But in a couple of places, those walls of dead opened up into sculpture gardens, where the deceased or the family of the deceased wanted more than a thin protected ledge to balance the vintage Star Wars figures that the dead treasured while alive. They wanted a full-fledged monument. Statues. There were angels and monks and mausoleums and one guy sculpted in contemporary clothing with a beer in his hand that I couldn’t bring myself to photograph because it felt as if I was somehow photographing him instead of his grave marker. 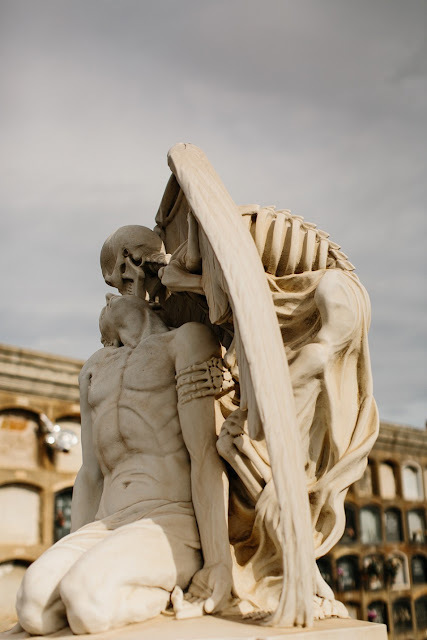 And, of course, there was a bony figure making out with a corpse. The sculpture is called The Kiss of Death, and it’s no random adornment. It marks a dead man. 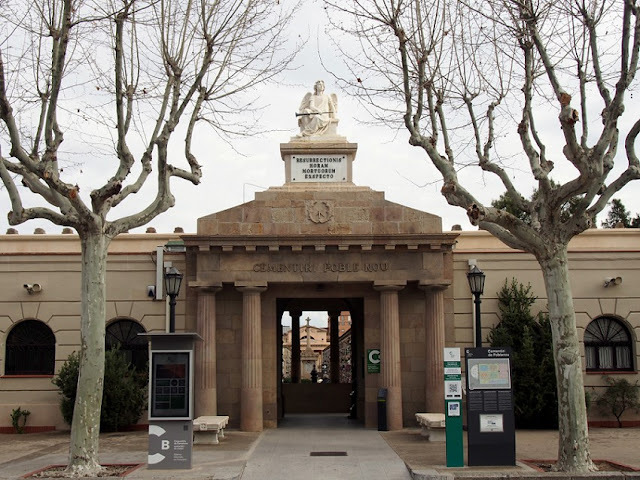 The name on the grave is Llaudet Soler, although information online dubs the man Josep Llaudet Soler. As far as I can tell, he wasn’t famous in life, but he sure made up for it in death. 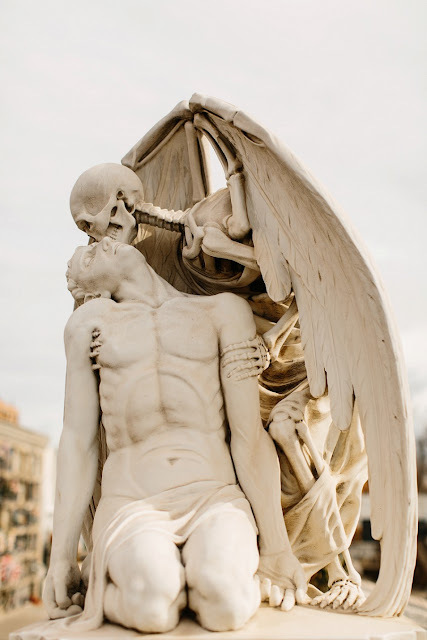 I mean, he wanted bad enough for a winged skeleton kissing a man above his grave. And not just wanted it in the abstract like I assume we all do. But was motivated enough and un-self-conscious enough to commission it. I want Ray Harryhausen to animate it. 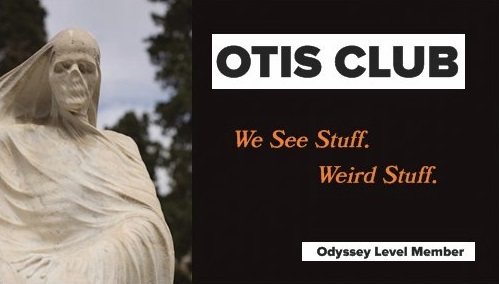 Had you asked me two months ago what grave I absolutely needed to see for purely aesthetic reasons before I was tucked into my own, I probably would have said this one. And now that I’ve seen it, I’m going to update my answer to, I don’t know, probably this one.